Summary: Yun Ling Teoh is the sole survivor of a secret Japanese concentration camp in Malaysia. From flashbacks, we piece together that Yun Ling escaped the torture with a maimed hand and a damaged psyche, while her sister perished in the camp. Over the years, Yun Ling has tried to find the location of the camp to no avail. Yun Ling's had always been fascinated by Japanese gardens. When they were little, they had visited Japan and been to a wondrous garden, the memories of which had brought them peace and stupor in the camp. Now, Yun Ling wishes to build a Japanese garden as a memorial to her sister. Yun Ling tracks down an elusive Japanese gardener named Aritomo, rumoured to be the Japanese Emperor's gardener. He resides in the mountains where he has built, unknown to most, the only Japanese garden in Malaya. It is called Yugiri, or the Garden of Evening Mists. It is a struggle to visit him, for Yun Ling is filled with burning, seething hatred for the Japanese for what they did to her family, and her land. Her life after the camp has been devoted to bringing justice to her sister. When Aritomo merely bows to her the Japanese way, she can't stand it. At first, he refuses her request to build a garden, and she is infuriated. But there is something Aritomo sees in her; and it may be her passion, his sympathy or some hint of potential that makes him strike a compromise. Rewriting the course of their lives, intertwining them in each other; he takes her on as an apprentice. Leap to the present day. Many years have passed, and little makes sense to us - but we know this: Yun Ling has returned to Yugiri after a long time, Aritomo has disappeared, and Yun Ling now suffers from aphasia. In a desperate attempt to hold on to her memories as they slip away, Yun Ling writes this: a chronicle of her life before Yugiri, at and after. So, the reason for the back story is, this book gave me exposure to the intricacies of Malaysian history, as a colony, the cultural diversity residing within the country and the Japanese military invasions and expansions in the east long before Pearl Harbor. Not to mention, the terrors of the concentration camps. The book also introduced me to the Japanese art and culture - the Japanese gardens, tattoo making, the precision of rituals, tea houses - and the revered status these arts enjoy. This contrast between the worship of the Japanese culture in the foreground of the treatment of the natives by the army forms the main conflict in the mind of our heroine; and the tragedy of the book. 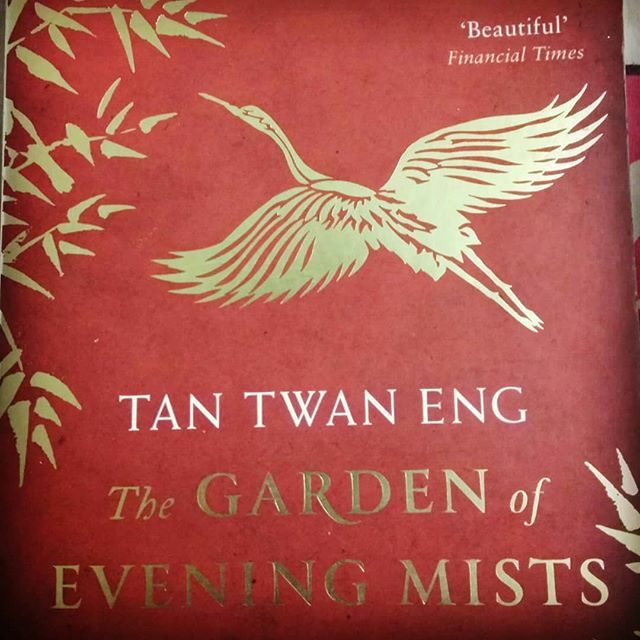 Yun Ling loves Yugiri, the garden of evening mists. It speaks to her; its utility, its artistic expression. 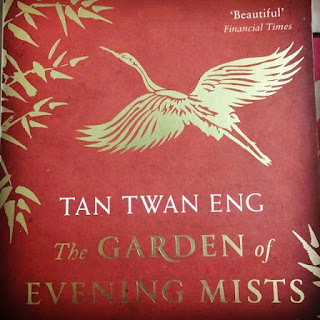 With Aritomo as her mentor, Yun Ling does physical labour in the garden with the other men and studies about the different forms of gardening from books. The more she learns, the more she begins to respect Aritomo - and struggles with her conscience that has so grown to hate anything Japanese. This is reminiscent of any colony-colonizer relationship; in mellower tones, the way Indians think of the English - a combination of exaltation and despise. I felt this very strongly - it caught me by surprise, even - in London; where I was awed by everything I saw while shuddering to see the remnants of Indian history displayed in museums as "gifts" from my people. Open secret: they were not gifts, just as the martyrs mentioned all around were not volunteers. And yet here I am, I read English, teach English and express adoration at telephone booths, red buses, Discworld and all things BBC. People around here still sometimes call English the colonizer's language; I have heard the media, of course, but also my friends call it that. What a strange dilemma to be in, what a strange hatred to have. Of course, in Yun Ling's case, it is not strange; for she suffered first-hand. And it must take a long time to reconcile with and face the consequences of such suffering. But there is always more than meets the eye, and in Yun Ling's case; it is a combination of injustice and guilt that fuels the rage. One of my favourite things about the Japanese garden was this technique Aritomo uses called "borrowed scenery." This involves taking into consideration the architecture and scenery that lie around the garden and incorporating them into the design of the garden. Instead of shutting out the outside world, this technique brings it in and the garden is more in tune with its surrounding, creating an enhanced setting. 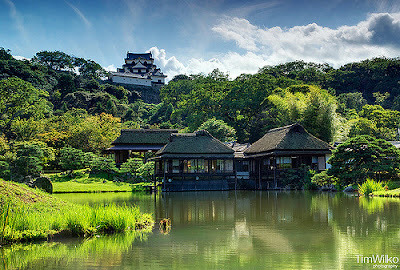 The picture below is an example of this technique, from the garden called Genkyu Garden with the Hikone castle in the background integrated into its design. 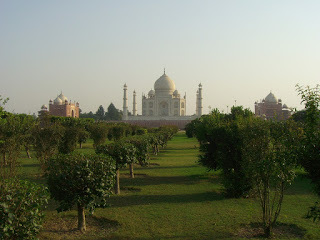 [[[Tangent: Looking at the picture, and learning about this form reminded me of our visit to Agra, in India, and the Mehtab Bagh - which is a Mughal garden situated to the north of the Taj Mahal, on the east bank of the Yamuna. As you enter the garden, gradually moving towards it centre, you notice the white marble structure in the distance. And when you reach the end of the garden, you realize that it is perfectly aligned with the Taj Mahal, which is like a focal point of the garden; though it lies much further away from it. The sounds of the world outside faded away, absorbed into the leaves. I stood there, not moving. For a moment I felt that nothing had changed since I was last here, almost thirty-five years before – the scent of pine resin sticking to the air, the bamboo creaking and knocking in the breeze, the broken mosaic of sunlight scattered over the ground. Guided by memory’s compass, I began to walk into the garden. I made one or two wrong turns, but came eventually to the pond. I stopped, the twisting walk through the tunnel of trees heightening the effect of seeing the open sky over the water. Six tall, narrow stones huddled into a miniature limestone mountain range in the centre of the pond. On the opposite bank stood the pavilion, duplicated in the water so that it appeared like a paper lantern hanging in mid-air. A willow grew a few feet away from the pavilion’s side, its branches sipping from the pond. In the shallows, a grey heron cocked its head at me, one leg poised in the air, like the hand of a pianist who had forgotten the notes to his music. It dropped its leg a second later and speared its beak into the water. Was it a descendant of the one that had made its home here when I first came here? Frederik had told me that there was always one in the garden – an unbroken chain of solitary birds. I knew it could not be the same bird from nearly forty years before but, as I watched it, I hoped that it was; I wanted to believe that by entering this sanctuary the heron had somehow managed to slip through the fingers of time. I've used this and other parts of this novel as literary analysis tools for students ever since I read the book over a month ago. And it works like magic; all the symbols, the imagery, the figurative language... and the effect created is indisputable. This atmospheric writing is the icing on the cake for the experience that is this book. A must read, if ever! Check out the book on Amazon! This entire plan to be a regular blog-poster is on the brink of failure yet again. But the other day as I was going through my giant suitcase of books (my room has no place) I found a much beloved tome - the Brewer's Dictionary of Phrase and Fable: 17th Edition. I had found this at Crossword of all places at a whooping seventy percent discount a couple of years ago. 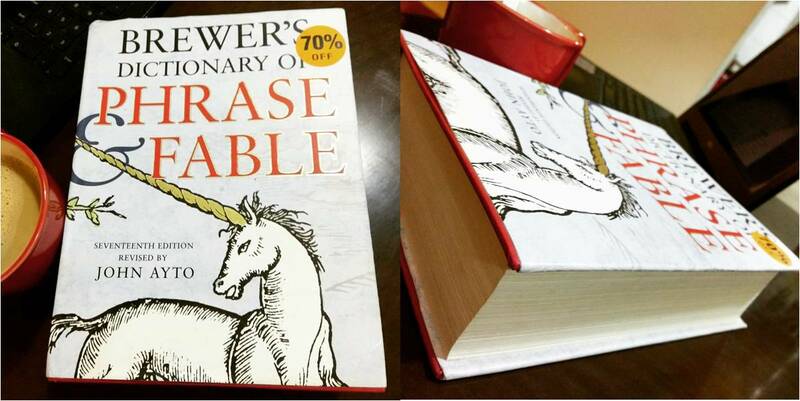 This book is a delight; gives a whole new meaning to the word dictionary. Amazon describes it in this fashion - "Much loved for its wit and wisdom since 1870, Brewer's Dictionary of Phrase and Fable takes you on a captivating adventure through its trademark blend of language, culture, myth and legend." So what I've decided now is a very simple ritual. No matter what I read or do every week, I will return to the blog every Friday to post about one word or phrase or word history from my ginormous dictionary of phrase and fable. The idea is to open the book to any random page and post the entry which most catches my fascination. CLOSE ENCOUNTER: Journalistic jargon for any meeting, whether personal or professional. Further on, Wikipedia says that there have been extensions to Hynek's list, so that there are now fifth and six kinds of close encounters to describe even further varying degrees of UFO contact. Another word I learnt today is ufology - the study of UFOs.